Less-Than-Truckload shipping is the smaller version of Full Truckload (FTL) shipping that offers businesses a flexible way to deliver their goods to customers, especially when the orders are large and heavy, or come in multiple boxes. LTL is also very economical, enabling you to make significant savings on your shipping costs. On average, LTL shipments refer to freight up to six pallets, oversized packages and crates. Any more than this, and you’re in Full Truck Load territory. If your business is growing and you’re moving into larger commercial shipping orders, LTL is a fantastic stepping stone that shouldn’t be discounted. In this comprehensive guide to LTL shipping, you will learn just about everything there is to know about this shipment method that saves you time, gives you more control and flexibility while driving down costs and enabling you to focus more on your core business. How is LTL shipping priced? Above all, remember that finding the right LTL shipping partner for your business is essential, ensuring that your entire shipment process is as easy and trouble-free as possible. Have you ever taken a delivery that came in a truck? Have you ever ordered an oversize product, or something that shipped out to you in a crate or a pallet? If so, you have already been on the customer side of Less-Than-Truckload, or LTL shipping. In the simplest terms, LTL shipping—also called LTL freight—is an industry term used for shipments that don’t need a full 48- or 53-foot truck to deliver. Instead, the LTL provider carries between 1 and 6 units of freight (typically a wrapped pallet, a wooden crate or even corrugated containers), sharing the truck space with other shipments. What is the Difference Between LTL Freight and LTL Shipping? There is no difference between LTL freight and LTL shipping: both refer to the same method of shipment, using different terms. When Should You Use LTL Shipping? Many businesses first consider LTL shipping when the costs of using their original shipping method become too burdensome. When that point comes varies from industry to industry and is dependent on what you’re shipping, but typically, if you’re already thinking about it, it’s likely time to upgrade. LTL’s biggest benefit at this point is that it offers significant costs savings at and after a certain weight point. If your goods are fragile, or prone to breaking, then LTL freight offers reduced breakage costs through the packing method: with everything into pallets and moved professionally by forklift, you minimize the risks posed by having multiple smaller packages being treated carelessly in transit to the final destination. You will have to prepare your shipment, which can be a little off-putting at first if you already have a streamlined process in place. However, the convenience and cost savings of LTL freight shipping more than outweigh this, and it doesn’t take long to establish a new, efficient packing process into your day. A guide to efficiently packing your shipment is covered in a section further below. Each of these variables affects the pricing of your LTL shipment, so it is worth spending time to judge exactly what you need, and the most cost-efficient solution. There are a few things to consider for each of these factors. The miles between point A and point B are factored into your quote. Now, this may seem like a straightforward pricing scheme, but there is one quirk of the industry that might surprise you: commercial shipments are delivered through “shipping lanes”, which can make destinations further away better value than closer ones. If you notice what seems to be an irregularity in charges for distances, this is almost always the reason why. Simply put, this is the weight of your shipment when everything has been packaged and it is ready for shipping. If your shipment is one unit, then you simply need the final weight of that unit. If you have multiple units, the combined total is your final weight for quoting. Your LTL carrier has limited space and dimensions within the truck, and knowing the dimensions of your freight is essential. The length, the width and the height need to be calculated for a single shipment. If you have multiple items of freight, calculate the height and width separately, but combine the lengths together for the final size and “footprint” in the truck. Sounds complicated? It can be, but accuracy is important here to avoid nasty surprises that go beyond your quote. Fortunately, many companies will do the math for you! Of the five factors involved in pricing your LTL freight, this is the most labyrinthine. Let’s stick to the basics to understand the most important aspect of this factor. Everything that passes through LTL shipping has a freight class, numbered between 50 to 500. The lower this number, the lower your freight costs. Needless to say, this can get very complex and confusing quickly, especially if you are new to LTL shipping. The good news is that freight brokers and carrier reps are enormously knowledgeable about classification, and will help you to get the best deal. There are many factors that go into calculating your LTL shipping rates, further on in this guide, we’ll show how you can work with brokers to make extra savings when shipping! Guaranteed for those times when you need to ensure that your goods arrive where you need them to be on a specific day, this is the best—and only—option. Assessorial fees are other charges from LTL shippers that aren’t standard across the main delivery types, but may be optional as a part of a delivery with additional fees, or extra costs for extra services. These are the most common ones that you will likely consider at some point using LTL shipping. Oversize Fees: the standard size of a pallet should be no more than 40” x 48” x 72”. Anything larger than this can easily result in a surprise oversize fee. Double check those measurements! Although LTL shipping might feel like a daunting task when you first consider it, the good news is that it is a streamlined process where you gain more control over the shipping process after an initial period of adjustment. At the most basic level, it can be broken down into 3 steps. The first step is deciding whether LTL shipping is cost-effective for your business versus your current shipping method. The best way to do this is to compare pricing by weight between your current shipping provider and a selection of LTL providers—there is a “tipping point”, and if you’re there or past it, it’s time to change over. The next section will deal with the specifics of getting the very best price, but if it is your first time, it’s best to use a freight broker to help you find the best LTL carrier for your needs. The final step is simply to package your goods correctly and schedule a pickup. If you’re unsure how to pack oversize goods and pallets, there is a full section further below to help you. 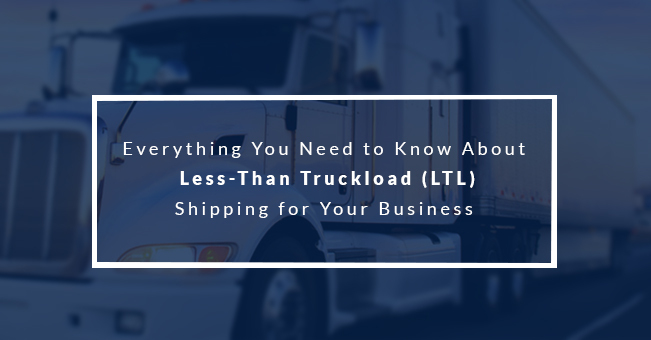 LTL shipping is a booming industry, and that’s good news for you: there are plenty of companies out there bustling to get your business. That said, you still want to get the best deal possible—and there are quite a few ways to do that. One of the easiest ways to do this is to engage with a freight broker, an industry expert who can look through the entire North American network to source the best LTL carrier for your freight. Better yet, it’s free to compare quotes from different brokers to get a better idea of your options. You can also take advantage of Freight Exchanges, which are websites that let you do the sourcing yourself—however, you won’t get the full benefit of the services that a professional broker can offer. Many brokers and exchanges have their own websites which are packed with information and allow you to set up your shipment easily, with all the features that you would expect from a shipping company. It’s useful to have all the following abilities in one place: compare rates and delivery times quickly, garner instant quotes, get shipment paperwork, schedule pickups at a good time and track your shipments progress. If you’re a small business with an irregular or semi-regular need for LTL shipments. Brokers or exchanges are an excellent choice. The process is streamlined, and there are rarely surprises, while pricing is often exceptionally inexpensive. Alternatively, you can opt to request FAK (Freight of All Kinds) rates. This is particularly useful if you have a mixed shipment when the NMFC codes are scattered around the 50-500 variables. Typically, you can negotiate your freight class down to a lower average, saving money in the process. A freight broker can be especially useful with this. Finally, if you’re planning to use LTL shipping on a regular basis, then you can ask for this to be taken into account, getting a discount on shipping volume alone. This tactic is best used only if you’re planning to use one carrier for all your shipping. Which service will work best for you and save you the most money is ultimately dependent on your business, your shipping requirements and, ultimately, the frequency and volume of those shipments. It’s worth trying out different methods to see which works best for you, not just in terms of cost-effectiveness, but also ease of use and optimization of your delivery. So, which one should you choose, how should you best pack and just where do you find the materials? We have all seen pallets—across the United States, pallets are the most common packing method for freight. It’s convenient, and can handle one oversize package or multiple smaller ones with ease, while also been perfectly designed for forklifts. The average pallet is 40” x 48”, and typically made of wood (plastic ones can also be found). These are in plentiful supply from both online and local suppliers, and their versatility means it’s worth saving any you receive in your own shipments. Once you have packed everything onto your pallet, you need pallet wrap, which is essentially saran wrap for packing. Once the goods are safely wrapped up, a plastic paperwork envelope and adhesive address labels are perfect for securing your invoices and other paperwork and having a clear address on display. If you choose to go with pallets, a pallet jack, fork truck, or forklift is a worthwhile investment for shifting stock around your premises safely, easily and efficiently. For single item shipments or shipments where your boxes are the same size, it’s very easy to pack a pallet. simply put everything on the pallet—but make sure that everything is packed neatly within the pallet dimensions to avoid overhang, and ensure that the top is flat. If you enjoy Tetris, then pallet wrapping can be a fun logistical challenge when you have different size boxes: heavier items go on the bottom, larger items on the outside, and smaller items in the middle. Pallets should be kept under 72”in height for land freight, or 48” if you are using air freight shipping—it’s worth double checking with your provider first to ensure smooth operation. Sturdy wooden crates are a classic storage method for deliveries, and offer many benefits, especially for expensive machinery or fragile items that can break easily when being transported to their end destination. Crates might have a classic shipment feel to them, but they can be costly to use. If you want the benefits of a crate—the superior protection from outside dangers—without the expense, then corrugated containers are an excellent choice. As a bonus, corrugated shipping containers also neatly sidestep the stacking issues that come with pallets. There are two types that you’ll discover: one is simply a large box that you can place on a pallet, the other comes with skids on the bottom side: both can be used with pallet jacks, fork trucks and forklifts for swift and safe movement. Made from reinforced cardboard, these are grown-up versions of the shipping boxes you may be more familiar with at this point. Containers are great for loose items and small boxes, but do remember to use protective padding for fragile items that could break in transit to your customers. What Type of Shipments Should You Send Using LTL Shipping? After a certain weight or volume, LTL shipping invariably becomes more and more compelling due to the economies of scale that it represents. But sometimes it’s just not enough. If your shipment is on the cusp, then you might find that discount multi-parcel programs from national companies like UPS or FedEx to be more cost-effective for your business at this time. UPS and FedEx are reliable carriers that offer predictable delivery times. They also offer many additional little services at no extra cost which LTL doesn’t, and are great for multi-parcel shipments between 150 to 200 pounds—however, you typically require a contract agreement or business account to be able to apply to them. As always, do your research, and make a decision based on what’s best for your business at this moment. Is LTL Shipping the Right Choice for You? Now that you know more about LTL freight and the process, you can begin to weigh up whether this is the best move forward for your business. Don’t forget, if you’re shipping oversize parcels, you simply don’t have another option. If your volume is increasing, then you already know that you need cost-effective solution to deliver your goods to your customers. Overall, LTL freight shipping is an excellent option for small businesses expanding their sales reach, and can help to slash costs by a significant factor. It does take time to adjust, but once you have new systems in place to do so, you won’t look back. Good luck—and happy shipping!